Notes: Metallic silver sticker, 78 x 123mm. Text: "FACT/US 46, RATIO > THE CIRCUS. On Stage, A CERTAIN RATIO, Final New York Performance. On Screen, THE FACTORY VIDEO CIRCUS (3/4"), ACR, Cabs, Durutti Column, Joy Division, NEW ORDER, Omitd, Section 25 amongst others. CHASE PARK, 599 Broadway, Wednesday, October 14th, 1981. VIDIO [sic] 9 p.m. > 12:30, RATIO 1 a.m. Factus 46"
This gig and video screening is related to the FACT 46 ‘The Video Circus' screenings and also to the content of FACTUS 5 Videoshow / From Manchester to New York Direct. 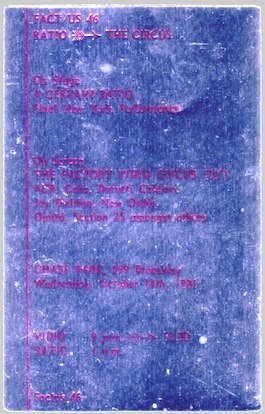 According to DONALD JOHNSON of ACR, the band were detailed to sticker widely across New York City to publicise the event.